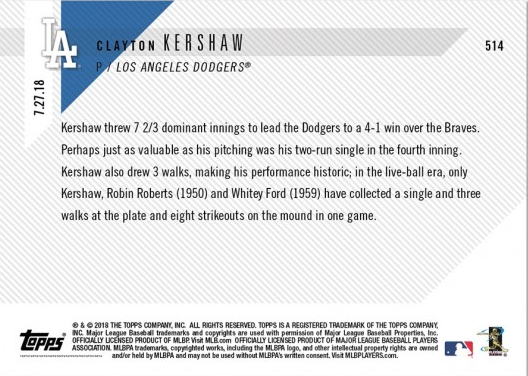 Kershaw threw 7 2/3 dominant innings to lead the Dodgers to a 4-1 win over the Braves. Perhaps just as valuable as his pitching was his two-run single in the fourth inning. 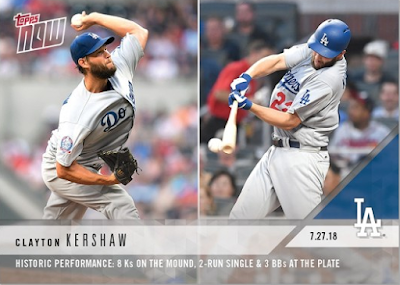 Kershaw also drew 3 walks, making his performance historic; in the live-ball era, only Kershaw, Robin Roberts (1950) and Whitey Ford (1959) have collected a single and three walks at the plate and eight strikeouts on the mound in one game.